Planning an engagement party can be a little daunting. Who do you invite? Where do you have it? What type of food do you offer? This is our engagement parties, in two parts of the world, with different groups of people, food, and themes. When you and your partner are from two opposite ends of the world, it helps when you can throw together two engagement parties! Here’s a little background story on us and the engagement. We both met while working aboard cruise ships. We were lucky enough to meet. Somehow fate intervened and out of the all the cruise lines, hundreds of ships and thousands of crewmembers from all over the world- we happened! Fast forward to the proposal a few years later. We are a low-key, simple and easygoing couple. So the proposal had to be just right. Within the first year of dating on the ship, we happened to have an overnight in Barcelona, Spain. This of all nights was the night Kevin told me "HE LOVED ME." I think he knew I secretly loved him for a while, but this was a pretty perfect moment. On the beach with the moon shining above, he dropped the "L" Bomb. Hello, big deal!! So what are the chances we happened to be back in Barcelona years later and have another overnight? As much of a romantic as Kevin is, he managed to keep this a big secret and got us to a lovely hotel room for the night. He knew I didn't want anything showy with a big presentation. So in our bathrobes in our hotel room after the most amazing night of eating, drinking and…star fishing, he popped the question! Without hesitation or even seeing the ring, I said 'YES." The rest is pretty much history! "Best Day Ever" however, later I realized we would have a few “Best Day Ever” moments. This was a chance for my side of the family/friends to come celebrate our engagement. We had the party in the backyard of my parents’ house. A good thing to remember when planning an engagement party is that you don’t need to splash out on a big venue. Because that’s what the weddings for! There is nothing wrong with using your parents’ house! With the help of my sisters we planned the whole thing down to every last detail. We had been brainstorming for months on colour, food choices, layout of the backyard and utilizing every little detail. 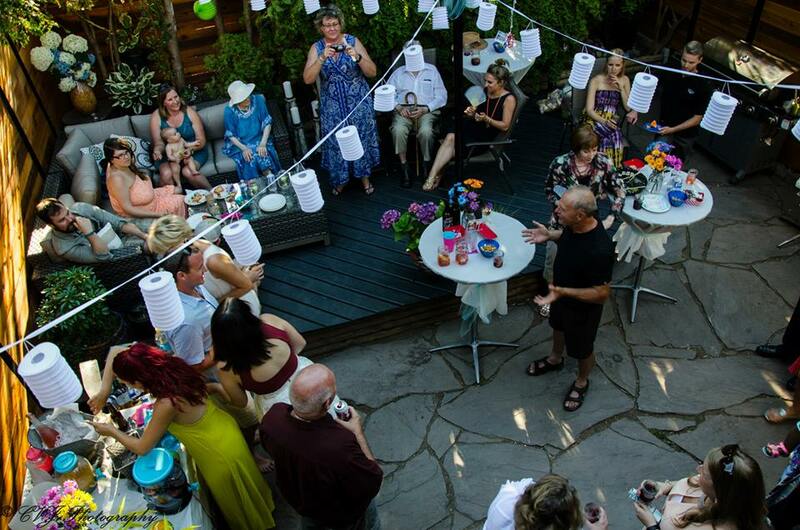 Even though it was being hosted in our backyard I wanted it to feel transformed when guests arrived. We rented high top tables and lights to add to the atmosphere. We managed to transform their backyard into a magical little escape. We found special “I do” bubbles and offered a signature drink to our guests. My parents offered to do most of the catering, which helped cut costs. We offered an array of foods and my dad's famous Argentina Burgers. I'm obsessed with dessert so we offered a candy bar for people to fill their jars up with at the end. With the help of our family and friends, we pulled off an epic party. The vision I had in my head became clear in our own backyard. With 50 of our closest friends and family, we drank too much, danced too much, ate too much! Even though it was a small area it made the party quite intimate. We were able to make the atmosphere more on a personal level by utilizing the space. This was the first time our families met and to say we all hit it off was a bit of an understatement. Instantly one big family! Moving forward six months- we had the second engagement party in New Zealand in the back yard of our house. With Kevin’s family and friends. This theme was completely different than the one we had in Canada. Again we used a simple location and spruced it up with decorations. The theme was more rustic and natural- hence the hay bails for seating and the old wine barrels used as the bar area. We had high top tables, lights above to strike the mood and a makeshift photo area under the tree. We lucked out that Kevin's parents made all the food and my dad made those famous Argentina Sliders! When your friends are super talented you should find ways to put them to work and we did! Cheers to everyone who helped put this party in motion. We know this engagement party was a hit as we still talk about it to this day. It may have ended with a dance battle between the Canadian and the Kiwis. It worked out that our parents and siblings could be at both engagement bashes! How amazing is that! For me I felt like this engagement party reflected the Kiwi side of things, very laid back as if we were just relaxing in the backyard. Of course we are all about sweets and desserts so we made a special dessert table for guest to fill up their goody bags on the way home. We are so beyond blessed to have such amazing friends and family share in our engagements. It truly was a sweet ending to a new begining. As for our wedding- we are only having one! The two engagement parties made sense and we had a blast planning and hosting them. We have decided on a destination wedding. Even though it was a tricky decision because Vancouver and New Zealand have so much to offer. I would love to have two weddings but the fiance, on the other hand, doesn't agree and I can live with that! We will do one epic wedding and always remember our two engagement parties- that were pretty magical.